A bottle of Town Branch Bourbon appeared at a recent gathering of friends. It’s a new bourbon from Dr. Pearse Lyons, the president and founder of Alltech, the global animal health and nutrition company in Lexington. 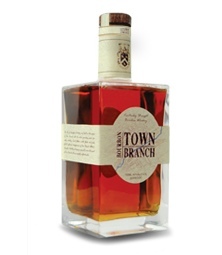 Town Branch Bourbon launched in October, 2011. It is named for the stream the runs through and beneath Lexington. Town Branch is the creek that runs through Lexington, below Rupp Arena in Lexington. Town Branch was the official spirit of the National Horse Show in Lexington in November. It launched two weeks before the show. It’s fun trying bourbons for the first time. You’ll have a general idea of what to expect, but there is always a surprise. Don’t get too locked into one bourbon, at least when you are out for dinner or cocktails. Don’t pass up the chance to sample a bourbon you’ve never had before. This entry was posted in Craft Distillery and tagged Alltech, Lexington, Town Branch. Bookmark the permalink.